Dovecraft introduce these trendy designer paper packs, by young designers. Dovecraft Designer Paper Packs are incredible value. Whats more, these designs are printed on heavyweight art paper (130gsm) that is acide & lignin free. 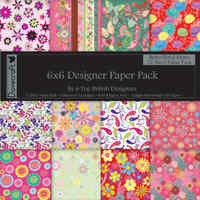 Each value pack contains 3, 4 and 6 sheets of 12 beautifully coordinated designs. Each value pack contains 3, 4 and 6 sheets of 12 beautifully coordinated designs. Available in 12x12 (36sheets), 8x8 (48 sheets) and 6x6 (72 sheets).